F&M Trust has been recognized nationally for its wellness program, which gives employees at the Chambersburg, Pa., community bank a variety of benefits to improve their health and their workplace. 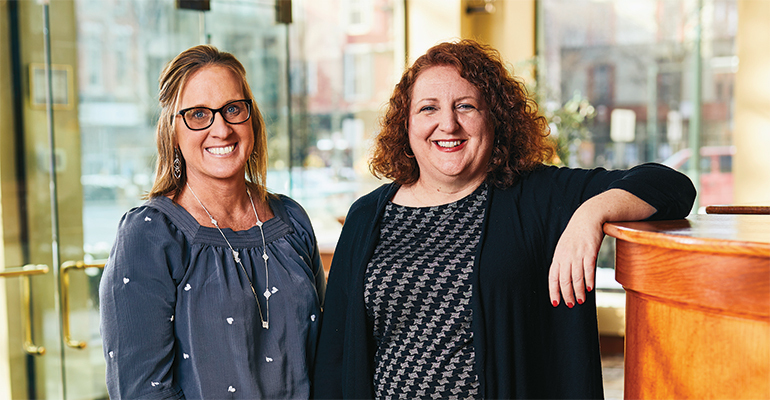 Through its award-winning wellness program, F&M Trust in Chambersburg, Pa., shows how much it cares about its employees. But the $1.2 billion-asset community bank also saves significant sums on healthcare costs. F&M Trust was recently honored with the Wellness Council of America’s Well Workplace Award for its “results-oriented” approach to wellness, backed by a “thoughtful operational strategy” that includes dedicated resources and volunteers from all levels of the organization, according to Sara Martin Rauch, the council’s director of strategic initiatives. Rauch cites a report by Quantum Workplace and Limeade that found when employees believe their employer cares about their health and well-being, they are 38 percent more engaged, 10 times less likely to be hostile, 17 percent more likely to still be working there in a year and 28 percent more likely to recommend their workplace—important in a tight labor market. Karen Carmack, F&M Trust’s chief human resources officer, agrees that the community bank’s wellness program speaks volumes about its commitment to the welfare of all its employees. “We’re also not just focused on the physical aspect, such as losing weight, but our wellness program is much more holistic, with programs to help with stress management, including guided meditation and onsite chair massages,” Carmack says. F&M Trust partners with Interactive Health to provide a web portal with health-action campaigns and education webinars that employees can access any time, says Teresa Kable, the community bank’s human resources generalist, who heads F&M Trust’s wellness committee. “Campaigns can be for physical activities, such as step challenges, or personal nutrition challenges, such as Color Your Plate, encouraging them to eat a variety of fruits and vegetables,” says Kable, who is a certified wellness and health coach, and a certified worksite wellness specialist. F&M Trust offers its employees free health evaluations that include onsite biometric screening and health risk assessments. Additional benefits of the program include onsite flu shots, health and wellness coaching, and a tobacco cessation program—all at no cost to employees. Employees who are members of a gym get reimbursed up to $300 a year if they attend a minimum number of times. The 18-year-old program began with a week-long employee health and benefits fair, but after employees requested more, the community bank expanded benefits and made the program year-round, Carmack says. It then created a wellness committee comprised of 16 employees of different levels to help design and implement the program. Carmack adds that the wellness program has helped F&M Trust reduce the cost of its health insurance. The community bank participates in a self-insured consortium with other banks, and while it funds upfront at the maximum level, each year F&M Trust is reimbursed for the amount the bank did not spend in healthcare claims. In 2018, the bank received a surplus of around $922,000, which equated to about $77,000 a month in savings. “Every year we’ve gotten back very healthy surplus amounts, attributable to our wellness efforts,” Carmack says. 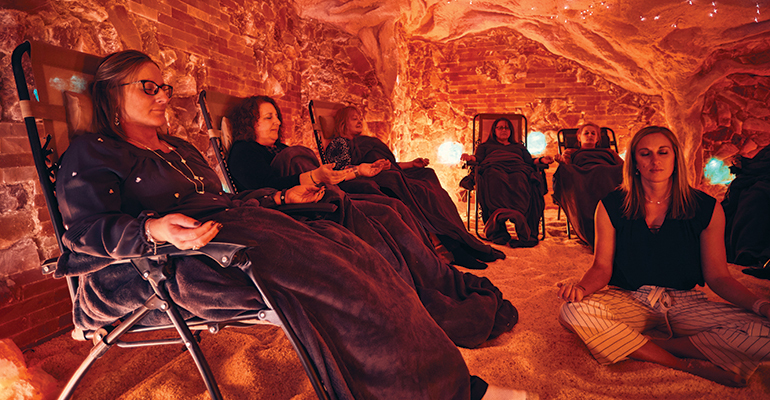 Kable and Carmack relax at the Chambers’ Wellness Center salt cave. Employees enrolled in the community bank’s health insurance plan receive an annual premium discount of more than $1,000 if they participate in an annual biometric screening and maintain a score within a healthy range, Kable says. She says employees complete a health interest survey every year to gauge what they want to get out of the program, as well as things they may want to change. “The younger generation coming into the bank might want to do things differently than what we have done in the past,” says Kable. Any community bank hoping to replicate F&M Trust’s successes should make sure it first understands the needs of its employees and its organizational objectives, Rauch says. “Then they should strategically set goals and chose interventions that will ensure success at achieving that value story,” she says. Companies considering implementing a wellness program should work with their health insurance partner, “so they don’t have to reinvent the wheel,” Carmack says. Secondly, they should get employees at all levels involved, including getting buy-in from senior management and encouraging more workers to participate.